Website conversion, especially collecting email addresses through your website, is one of the toughest tasks in SEO. When speaking to clients about their online marketing goals, list building is almost always identified as one of the top goals. Yet the vast majority of these websites hardly have any opportunities for their visitors to subscribe to their email lists or RSS feeds. You do not know how to collect emails through your website. You are overwhelmed with possibilities and need more direction on which options are best for you. You do not know how to find the tools and plugins to get these opt-in forms set up on your site. You just do not know the best practices to increase website conversions. Regardless of why you are not collecting emails yet, our digital marketing agency in Toronto is here to help. You will be glad to know there are plenty of ways you can capture email addresses on your website. Some of which are more effective than others, but it depends on your website and its purpose. 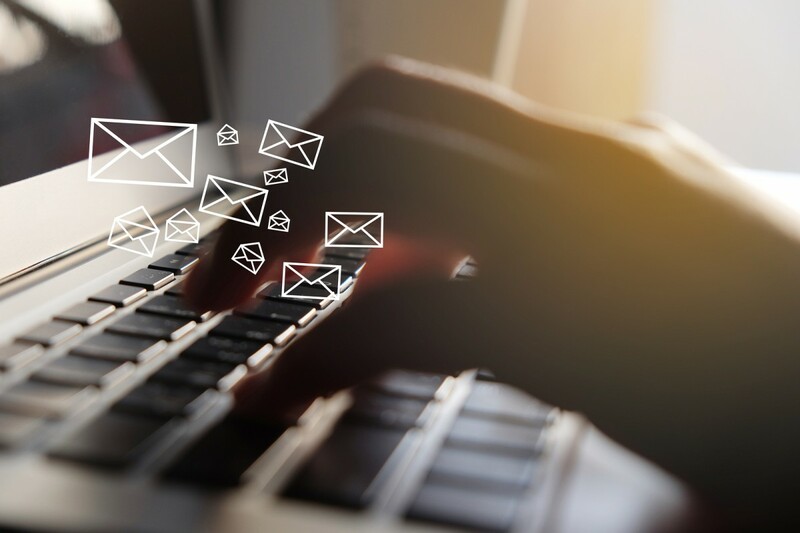 If you are hoping to find out how to capture email addresses on your website, then check out the advice in our guide below. One of the most effective ways to capture email addresses on your website is to have a form for people to fill out. This enables website visitors to input their contact details without hassle. There are two key things to think about here; your mailing list, and the form itself. Ideally, you should create an account with a mailing list management provider, such as Mailchimp, as they can assist you with setting up different lists and storing all the email addresses you receive. The form itself should have very few fields for people to fill in. It can be added to any site in seconds regardless of tech or CMS, even WordPress. All you have to do is copy and paste the code. Creating a Designated Landing Page to capture email sign ups is another effective method for gaining contact information. This is a page that people will see when they arrive on your website. Very often, landing pages are used by online marketers when they publish an online ad for someone to click on. The consumer/interested party clicks on the ad and get immediately taken to this page. 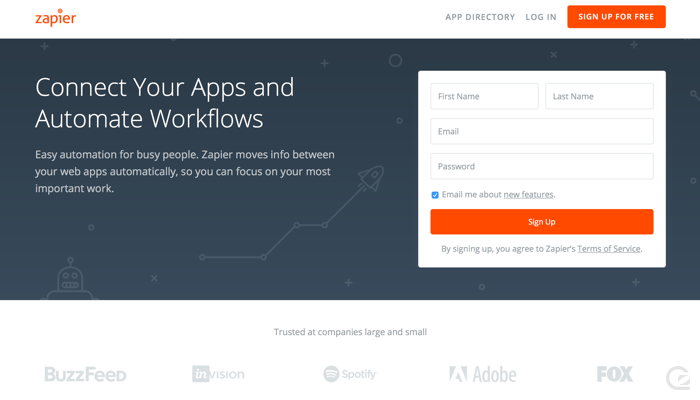 The following is an example of a highly effective sign up lading page created by Zapier. MailChimp has some excellent tips on how to create winning Designated Landing Pages for website conversions. Arranging for a pop-up to appear when a user signals their intent to exit your website is very tactful. One of our clients did this and their email subscribers jumped from 70-80/day to 200-300/day. Exit-intent is one of the newer technology available to businesses and is very helpful at predicting when a user is about to exit from a given website. Some list-building services have integrated it into their internet marketing plans because it garners very positive results. How does it work? When a website visitor is about to close or leave the browser tab, a pop-up sign up form appears. As a result, the user will stop to see what just popped up. Facebook is an excellent place to collect email addresses through. The Facebook ads are still much cheaper than Google ads and you may use this in your favor when building your email list. Facebook allows you to target your ads to very specific audiences using geo, gender, age and interest filters. Promote some quality content through Facebook and the flow of new emails address to you is guaranteed. 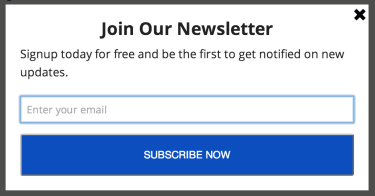 Put a newsletter/promotions signup link in your email signature. This way, people you communicate with through email will always have the opportunity to sign up for your newsletter. This method when combined with the other 4 in this list produces stellar results. Think of it as a subtle reminder whereas the other methods are more noticeable. Building your email list yourself is a process that takes time. Provide quality content consistently, package it in a beautiful email design and your subscribers will now have a reason to fill out. They may even recommend your email to friends and colleagues. iRISEmedia is an internet marketing company located in Toronto that focuses on helping clients in Canada, the U.S. and globally with digital marketing services consisting of social media marketing, website design, SEO and SEM, app development, online reputation management and online PR. Our team helps clients manage and grow their online presence and branding to increase their social media presence, qualified web traffic and online leads. For any internet marketing needs or inquiries, please contact us today. We would love to hear from you.